Editor and literary consultant at JC Consultancy. Freelance writer. This weekend is the sixth anniversary of the BookRambler blog; six years of blethering about books, events, authors, writing, and publishing. If you’ve followed from the beginning or just started – thanks for reading. I’ve read some wonderful books I’d never have discovered, met intelligent, truthful, funny, witty, and wise writers, and listened to brilliant, entertaining writers speak with passion about writing and books. When I started blogging I wanted to read the books I wanted to read, and to say what I wanted to say about them. I wanted to be critical and analytical; hold writing to account. another [six years] over, and what have you done? This anniversary is a reminder and a call to action to the earlier me who wanted to write fearlessly. I find the more I blog about books, the more reticent I am becoming about saying what I want to say. I’m holding onto the fear that I’m not saying the right thing; afraid of causing offence; holding back because of what people will think about me through what I say about books. I realise that what I talk about when I talk about books is a barrier to breaking away from the fear. So I’m putting us on notice. I’m on the look-out for writing that can stand up to critical scrutiny: books I want to keep on my shelf and re-read many times over. And I’m on the look-out for those times when I want to shy away from saying what I want to say. Bold is the new black. The setting of A. D. Miller’s second novel is a world away from the drug-fuelled, snow-bound streets of corruption-filled Moscow depicted in Snowdrops, his Man Booker shortlisted first novel. Opening in sunny, drug-free California in the summer of 1993, Miller’s story follows the decades-long friendship of two Englishmen, Adam Tayler and Neil Collins, who first meet at a beach hostel in San Diego. Miller compares the shifting moods, one-upmanship, and petty jealousies to a courtship as they share an off-beat sense of humour, perform a karaoke duet of “Take it Easy”, and swim in the warm Pacific at midnight. Still in their early twenties, both are defined by their upbringing. At first, Neil is insecure. On a short break between jobs he is provoked by Adam’s mild questioning about his future plans (he thinks Adam is suffering from “the tyranny of vocation among well-bred graduates … the idealism that someone else was always paying for”), while Adam is oblivious and naïve, enjoying a gap after graduation before making a decision about his career. They agree to deliver a “Driveaway” to San Francisco, but stop off on the way to take in the sights, and they join a disparate group of tourists to visit Yosemite National Park. It is here that they see the “Faithful Couple”, a natural phenomenon in the Mariposa Grove in Yosemite National Park: two giant sequoias fused together into a massive tree trunk at their base, separating into individual trees the higher they stretch toward sunlight: “they only existed together, in their rivalrous embrace”. Adam and Neil are photographed in front of it, posing in mock dispute. It is here too, that Miller’s “faithful couple” become fused through an event with far-reaching consequences for both of them when the edgy competitive streak fuelling their friendship weakens their moral compasses. “In California the lies they told felt almost true. Or, if not true, at least possible, as if Neil might plausibly be someone new if he and his new friend willed it.” Of course, there’s a girl at the core of this male-focused story. Her absence constitutes a presence in their shared secret history. However, he needlessly yokes Adam and Neil’s chosen careers to the economic and social climate of each decade, and it seems unlikely that they would keep in touch long after 1993. Adam joins the Civil Service and works on immigration cases for the Home Office, later moving into consultancy work on Neil’s (bad) advice, while Neil enters business with a dot.com enterprise called HappyFamilies, moves on to the London property market, and swiftly into hedge funds. The guilt they thought they’d left behind at Yosemite, though, resonates through their see-sawing fortunes, seeping out only as each begins to consider the moral consequences in light of subsequent experience. If The Faithful Couple is Beaches for blokes, The Winter War, by Finnish-Swedish author Philip Teir, could be an ironic version of Neil’s HappyFamilies.com. In Teir’s clever first novel, two things are certain from the outset: sociology professor Max Paul will divorce, and the hamster, crushed underfoot in the slapstick opening scene, will reappear at an inconvenient moment. Originally published in Swedish under the subtitle “A Novel About Marriage”, the story revolves around the Paul family of Helsinki: Max, nearing his sixtieth birthday, is working on his magnum opus, a revisionist biography of Edvard Westermarck; Katriina, his wife, is depressed in her HR job at a local hospital; eldest daughter Helen, a teacher, is struggling with control issues, and Eva, a 29 year-old eternal student, is in London deciding what she wants from life. Two historical wars frame the story’s chronology: the historical Winter War of 1939-40, when the small Finnish army held the Mannerheim Line against advancing Soviet Union troops, and the summer war of 1808, when the Czarist army captured territory from Sweden along Finland’s Österbotten province. It is no coincidence that Max is originally from Österbotten, and Katriina’s roots are in Czarist Russia. Helen is teaching Linna’s novel, The Unknown Soldier (the Finnish recaptured territory from the Soviets in the Continuation War of 1941-44), and Eva visits the front line of the Occupy movement outside St Paul’s cathedral. While it’s a cliché that marriage is a battlefield, Teir’s slanted view of family dynamics is inventive, solidly crafted, and highly entertaining. Emily Dickinson (1830-1886) only published a dozen or so poems in her lifetime, but even before Mabel Todd edited the posthumous slim collection of her poems in 1890, she was known locally as “the Myth”. The afterlife of the secretive recluse still ripples across academic circles and the popular imagination; it is surprising to learn that, as recently as 1984, the details about the illicit love affair between Emily Dickinson’s brother and their Amherst neighbour was first brought to public attention in Polly Longsworth’s sympathetic study, Austin and Mabel. More recently, Lyndall Gordon’s 2010 revisionist biography, Lives Like Loaded Guns, dug deeper into the known facts. But fiction has a truthful purpose too. William Nicholson’s entertaining, respectful story throws fresh light onto the extraordinary love affair between 55-year-old Austin Dickinson and 24-year-old Mabel Todd. We cannot know for certain what the lovers shared in the privacy of Emily Dickinson’s dining room, where they often met, or what she saw and heard there, or the effect on her poetry. By interspersing his narrative with snippets of extant correspondence, diary entries, and secret notes, drawn, mostly, from Longsworth and his own research in the Sterling Memorial Archives at Yale, alongside some of Emily Dickinson’s passionate poems, Nicholson creates a solid historical foundation from which he imaginatively recreates the time period and personalities involved. Moreover, the physical act of researching “the very notes they sent each other with such secrecy” is an integral part of the story, adding an air of factual realism from which he speculates as plausible as a biographer does. Mavis Loomis Todd (1856-1932) arrived in Amherst in 1881 with her husband, David, who had been appointed director of Amherst College Observatory. Entering into Amherst society, she first struck up a friendship with Susan, Austin’s wife, and thereafter entertained the Dickinson household next door. By then the “Homestead” was occupied by Austin’s sisters, Emily and Lavinia (Vinnie), and their invalid mother. Although Mabel never met Emily (she would listen at the top of the stairs while she played piano and sang), they communicated through notes and gifts. Running in parallel with the story of Austin and Mabel, is the modern-day story of Alice Dickinson (no relation) who arrives in New England to undertake background research for her screenplay about their affair. Through her lover-turned-friend Jack Broad, Alice gets in touch with Nick Crocker, a visiting professor (with a reputation), and she accepts his offer of temporary accommodation. Alice, Jack, and Nick pull us back to previous books in Nicholson’s interconnected series: in The Secret Intensity of Everyday Life (2009) Nick has an affair with Laura Kinross (Broad), while in All the Hopeful Lovers (2010) Laura’s son Jack is put together with Alice through Facebook in much the same way that his response to her Facebook request for information about Emily Dickinson sends her to Nick’s door. As she becomes caught up in an affair of her own, Alice reflects on romantic love and passion, and ponders the “I” in Dickinson’s poems and the poet’s relationship to Mabel. “Something true and powerful is at work here. What if it’s something bigger than love? What is there that’s bigger than love?” In New England for just two weeks, her emotional attachment to Nick is perhaps too quickly established, but is nevertheless a necessary part of the storyline. Stand at the top of the stairs. Look down into the dark hallway below. She’s there with him, the one he loves, the one I need. A door opens. The rustle of a dress as a half-glimpsed woman passes quickly down the passage, and out of the back door. While it is but a step from fictional stage directions and camera angles to thinking about the screen version from the writer of Shadowlands lurking in the background, something deeper is going on. Alice’s problem (aside from the fear of tackling her first screenplay) is how to find a way into a story she doesn’t fully understand. “My story, Alice tells herself, is about Mabel, who chose life in all its mess and hurt, not Emily, who withdrew into the sepulchre of her own room. And yet in every picture she forms of Mabel, Emily is near, the listener behind the closed door.” With Nick, she discusses the process of storytelling; how to frame her fiction, and whether she needs to care about Mabel in order to write her story. The Lovers of Amherst is a rich resource for writers. Without Mabel Todd, we may never have known about the extent of Dickinson’s creativity. It was Mabel who undertook the task of preserving many of the letters and poems that survive, bringing order to the mass of 1800 poems with painstaking transcription, and pushing forward with publication. Nicholson’s story continues on after the deaths of Emily and Austin to explore Mabel’s motivations. His great achievement, though, in The Lovers of Amherst – is to compel us to read Emily Dickinson’s poetry again, with fresh eyes. Up on Publishers Weekly, Matt Sumell’s piece on Why Writing is So Hard (March 13th) speaks to my inner critic – how do you switch her off? Should I lock her in a cupboard? Sumell skates across American male approaches to writing – Hawthrone, Hemingway, Thompson, Michael Herr’s Dispatches, Frederick Exley’s A Fan’s Notes, – a nod to a couple of women would have widened out his thinking – but this is his experience and it’s insightful and true about the difficulties of writing through yourself. with writing there’s no formula that makes sense to me, no recipe to follow, no map—at least no map I know how to read—to help me navigate. Every story is different, and every story comes with its own specific difficulties, so every story also comes with its own specific anxiety and panic until it’s done. Only—as they say—it’s never done, just abandoned. it’s one of the funniest (and best) books of the year, featuring the self-destructive but well-meaning Alby–a “loser,” according to his sister. I’ve read and enjoyed Anne Tyler’s writing since her first novella – A Slipping Down Life (1969; reissued by Vintage, 1990). Dinner at the Homesick Restaurant (1998) is one of the best books ever written. Her latest, A Spool of Blue Thread is a richly textured story about a Baltimore house and the Whitshank family who have lived there for two generations. Tyler spools back and forth between the present and the past, unpicking the “embroidered” truth of family legend – the Whitshanks “had a talent for pretending everything was fine” – to reveal self-delusion and disappointment. Junior Whitshank relates how this son of “poor white trash” in the Appalachian Mountains came to live in the house he built for someone else, while his daughter Merrick is proud to tell how she married her best friend’s boyfriend; in the present, Abby Dalton is married to Junior’s son, Redcliffe (Red) and they are living in the house. She loves to reminisce about her romanticized memories of the day in 1959 they fell in love, while forgetting to mention that she was with another boy that day. Theirs are the Tyleresque lives of “unremarkable people”. As accomplished as her 1988 Pulitzer Prize-winning Breathing Lessons, it is the best novel Anne Tyler has published in decades. Three of Abby and Red’s four children have married and left home, but Denny, their estranged eldest son, is unsettled, often arriving unannounced and departing just as abruptly, often in a huff. It is a masterclass of restrained writing, lightened with gentle comedy and pitch-perfect dialogue, revealing characters and their motivations slowly, through sibling rivalry and a rising tension that finally overspills in a punch-up in the kitchen. ‘Who said, “You’re only as happy as your least happy child?”’ she’d [Abby] asked Ree in last week’s pottery class. The complex narrative has more layers than Merrick Whitshank’s wedding cake, held together by recurring motifs and repeated images. Abby, out in her nightgown and slippers during a “derecho”, or fierce storm, to gaze at the “giant tree . . . like a huge stalk of broccoli lying on its side, only with roots”, links the Wizard of Oz, Hurricane Sandy, and the rings on the tulip poplar felled for a wedding photograph. It also resonates with the destructive tree of The Beginner’s Goodbye. Tyler’s twentieth novel in her fifth decade of writing has playful, knowing nods to previous books: a company for travellers who dislike travelling (The Accidental Tourist); a restaurant named Thanksgiving (Dinner at the Homesick Restaurant); Abby feels that life is “slipping through her fingers” (A Slipping Down Life), memory loss (Noah’s Compass), and more. It is as if she has gathered together the threads of her entire oeuvre as an added reward for her attentive, loyal readers. Anne Tyler was interviewed for the BBC World Service this week – listen in to the wonderful discussion of Dinner at the Homesick Restaurant, which offers a glimpse into her writing and ideas. H is for Hawk, by Helen Macdonald is a rare book – as rare as Mabel the goshawk. Last August I read it in proof for review, expecting it to be a maudlin, self-indulgent memoir. It has since gone on to win the prestigious Samuel Johnson Prize and the Costa Book of the Year, and is currently finding new readers who love it on the other side of the Atlantic. Macdonald’s writing rips up tired conventions and reveals how to write in a tone and language that is both literary and commercial. Needless to say, she won me over. Early one morning, “overtired, overwrought”, Helen Macdonald races from Cambridge to the countryside, thinking that a goshawk sighting will soothe her jangling nerves. Watching a pair of goshawks “soaring above the canopy”, she reminisces about a day she spent with her father when she was a child. She was bored, restless, waiting for a sight of a sparrowhawk, and he explained to her the meaning of patience: “when you wanted to see something very badly, sometimes you had to stay still, stay in the same place, remember how much you wanted to see it […]. If you want to see hawks you have to be patient”. She brings home in the pocket of her jacket “a small clump of reindeer moss […] a little piece of that branching, pale green-grey lichen that can survive just about anything the world throws at it”. Three weeks later, this little memento becomes imbued with weighty significance when she takes an unexpected telephone call: “it was the reindeer moss I was looking at when my mother called and told me my father was dead”. Macdonald’s fraught memoir juxtaposes an interior journey through the different stages of grief with an exterior struggle to train a goshawk. She travels from despair to hope, and denial to acceptance; but what rescues the book from cliché is her weird, wonderful style, her intellectual passion, and the associations she forges between wide-ranging topics. H Is for Hawk is partly a literary and biographical study of T. H. White and his books, partly a literary history of goshawks, landscape and culture, and partly a psychological study of grief; the writing is rich and revelatory. An experienced falconer, Macdonald had never trained a goshawk, a large bird of prey a little short of three inches smaller than a golden eagle, but, after her father’s sudden death, she has a recurring dream about a time when she released a goshawk into the wild: “She opened her wings and in a second was gone. She disappeared over a hedge slant-wise into nothing. It was as if she’d found a rent in the damp Gloucestershire air and slipped through it”. The decision to train one, she proposes, is an “inevitable” one for her to make. Macdonald’s lyrical prose depicts her inner climate with vivid imagery, fresh similes and metaphors, and loose, run-on sentences that cast familiar places, tasks, and objects in a strange, ethereal light. Here, for example, in a scene of high drama and suspense, Macdonald is simply buying a goshawk from a Belfast breeder on a Scottish quayside. [A] man was walking towards us, holding two enormous cardboard boxes like a couple of oversized suitcases. […] The air turned syrupy, slow, flecked with dust. The last few seconds before a battle. And with the last bow pulled free, he reached inside, and amidst a whirring, chaotic clattering of wings and feet and talons and high-pitched twittering and it’s all happening at once, the man pulls an enormous, enormous hawk out of the box and in a strange coincidence of world and deed a great flood of sunlight drenches us and everything is brilliance and fury. […] She is a conjuring trick. A reptile. A fallen angel. A griffon from the pages of an illuminated bestiary. Something bright and distant, like gold falling through water. A broken marionette of wings, legs and light-splashed feathers. She takes the bundle of wilderness into her home. The goshawk perches in her living room, and she names her Mabel. Training a goshawk takes time and patience: two of the things which Macdonald does not have at this point in her life. Her University post is coming to an end and she should be sorting out a new job and finding new accommodation. Instead, she retreats from the world, cuts herself off from human contact and lives within the constrained confines of her Cambridge living room; the telephone is unplugged, the curtains are drawn over the cityscape, and her freezer is filled with day-old chick carcasses. In her self-imposed solitude, she watches the hawk, waiting for that moment when it forgets that she is there. It is a stage in hawk training known as “manning”, and it demands total vigilance and stillness. Attempting to become invisible to the hawk to encourage it to take food from her hand, Macdonald empties herself of all thought, and, in a moment of high intensity, she experiences a similar transfer of consciousness as White and Baker: “as if it was another person’s heart, or something else living inside me. Something with a flat, reptilian head, two heavy, down-dropped wings”. Arranged in two parts, and a “Postscript” of follow-on research, the fragmented memories arranged “like heavy blocks of glass” enact the emotional impact of bereavement on the psyche. Training the goshawk, she narrows her perception to the hawk’s view during a gruesome period of hunting with Mabel in the English countryside; she “slip[s] into the exquisite, wordless sharpness of being a hawk”. Nature seeps over the boundary of her selfhood. She becomes as wild as Mabel: she kills half-dead rabbits caught between Mabel’s talons, pushes bits of animal bones into her waistcoat pocket, and trespasses across land containing pheasant runs. Her humanity is exposed in the compassion she retains for the prey which Mabel brings down: as Mabel gorges on their innards she is obsessed with killing them quickly to prevent their prolonged suffering. “ ‘The best thing for being sad,’ replied Merlyn […], ‘is to learn something’ ” (T. H. White, The Once and Future King, 1958). While the memoir focuses on a particular time-period, Macdonald’s ideas cover a kaleidoscopic range of topics. As well as falconry, it includes topics as diverse as memory and narration, Arthurian mythology, the cult of chalk and history, aeroplane spotting, and environmentalism. A throwaway line from a male friend who advises her to “ ‘leave goshawks to the goshawk boys’ ”, sparks a literary quest to trace gendered bias in falconry books. She is surprised to learn that goshawk behaviour is described according to negative female traits. Goshawks “ ‘can be moody and sulky’ ”, “ ‘disagreeable’ ”, “ ‘[n]ever was there a more contrary bird’ ”, all of which makes them difficult to “man”. However, she finds that, in seventeenth-century falconry guide-books, they are “ ‘stately and brave […] shye and fearful’, and ‘it is the falconer’s role […] to provide for all his hawk’s needs so that she might have ‘joye in her selfe’ ”. It is an odd decision to exclude a similar detailed analysis of The Peregrine than is afforded to T. H. White’s writing. Macdonald explains that she turned away from Baker during this period because his quest was a hopeless one, but her description of Baker’s obsessive search for the peregrines in her 2006 study of falcons resembles her own quest for consolation in the natural world: “the diaries of a soul’s journey to grace […] the diaries of a man seeking to become invisible”. She does not accept the view he presents, that “the world was dying, and his hawks were icons of extinction: ours, theirs and his own” (Falcon). White’s shadow hovers over the pages while Macdonald conducts “a quiet conversation, of sorts” with him. She challenges White on his “novice austringer” skills, and takes him to task for ignorant cruelty in the way he trains his goshawk, and she wonders about White and his time alone with Gos. “His young German goshawk was a living expression of all the dark, discreditable desires within himself he’d tried to repress for years: it was a thing fey, fairy, feral, ferocious and cruel”. Rebecca Solnit has written recently about how, as a child, she “disappeared into [books] like someone running into the woods” (The Faraway Nearby, 2013). It is an apt description of the kind of vanishing act that Macdonald accomplishes in her nuanced readings of White’s literature and biography. It is a two-way transference: he haunts her memoir and she inhabits his writing, transitioning smoothly between her voice and the voice she creates for him. In places, though, it’s as if Macdonald doesn’t trust her reader to make the connections she wants her to see, and the narrative is forced into a narrow pattern that flies in the face of its expansive ideas. The relevance of reindeer moss, for example, is over-emphasised; the opening is set up to show its significant symbolism in the narrative theme of “patience made manifest” that plays out over the course of her journey. At other times, for example, in her etymological detours, she doesn’t push as far as she could go. “Here’s a word. Bereavement. Or, Bereaved. Bereft. It’s from the Old English bereafian, meaning ‘to deprive of, take away, seize, rob’ ”. There’s a missed opportunity to complete a link with bereavement and patience through her reading of White, although its meaning resonates within the wider context of loss. The “I” in the passage below is White’s, nonetheless, the patient suffering she depicts is also her own. I must not look the hawk in the eye. I must not punish the hawk, though it bates, and beats, and my hand is raw with pecks and my face stings from the blows of its bating wings. Hawks cannot be punished. They would rather die than submit. Patience is my only weapon. Patience. Derived from patior. Meaning to suffer. It is an ordeal. I shall triumph. In Negotiating with the Dead: A Writer On Writing (2003), Margaret Atwood considers “all writing of the narrative kind, and perhaps all writing, is motivated, deep down, by a fear of and a fascination with mortality—by a desire to make the risky trip to the Underworld, and to bring someone or something back from the dead”. In hawk mythology, hawks carry messages from the dead to the living. Macdonald developed an interest in falconry as a child, and it was as a child that she first read The Goshawk. In her “archaeology of grief” happy memories of bird-watching with her father punctuate the narrative: “my dad had been my dad, but also my friend”. Re-reading The Goshawk, she follows a path back into the woods of her childhood reading, and to the desire she once had for a different ending to White’s book; that his lost Gos would return to him. When it’s time for Macdonald to send Mabel from her fist up into the sky, to wait and watch for her return, she is fearful that she will fly off forever. Metaphorically, she is also flying with Mabel to bring her father back from the “tangled woods”. It is to be expected in a memoir about a hawk, which is also about grief, that the hawk would represent flight of some kind, after all, “ ‘Hope’ is the thing with feathers/that perches in the soul’ ”, but the shifting symbolism of Macdonald’s goshawk is not so easily defined. In the first part, it is perhaps hope deferred. When her father dies suddenly, time stops, and she slips into the space between that part of her story which has ended and the new one which is not yet written: training a goshawk is a bridge over the chasm in her selfhood. The second stage in hawk training is termed “carriage”, walking outside with it perched on her falconer’s glove in order to reintroduce it to the world; the goshawk is perhaps the outward manifestation of her grief in the manner of the young girl in Anne Hébert’s poem, “The Tomb of Kings”, who carries her heart on her fist in the form of a blind falcon. Fixing a single meaning onto the goshawk, though, limits the imaginative scope that Macdonald’s empathetic writing opens for the reader; it is also impossible to pin it down. It is easier to establish what the goshawk does not represent: a romantic way of thinking about the natural world. I’d thought that to heal my great hurt, I should flee to the wild. It was what people did. The nature books I’d read told me so. So many of them had been quests inspired by grief or sadness. […] ‘Nature in her green, tranquil woods heals and soothes all afflictions,’ wrote John Muir. ‘Earth hath no sorrows that earth cannot heal.’ Now I knew this for what it was: a beguiling but dangerous lie. […] Hands are for other human hands to hold. They should not be reserved exclusively as perches for hawks. And the wild is not a panacea for the human soul; too much in the air can corrode it to nothing. H Is for Hawk is a mature, accomplished work: a touchstone for future memoirs, bibliomemoirs, and writing that deals with the natural environment and the self. CB‘s collection is a ‘biography of a small town’ [fictional town named ‘Glanbeigh’ and surrounding area of County Mayo ]: “My town … is nowhere you have been, but you know its ilk.” A shy, unassuming writer who surprised me with the emotional maturity and sly humour of ‘The Clancy Kid’; the story he read. GS‘s collection is ‘elegant, humble and humane’: James Kidd. I read the short story called ‘Fusilli’ on the way to the event, and nearly cried on a packed train because of the restrained way it unfolds a story of loss and longing. Before I head off to Edinburgh for the next three weeks, here’s a round-up of summer reading. Not beach reads; who can read in the sunshine?, but some of the new books that kept me entertained while you were all out playing football and running around Glasgow. **Helen Macdonald’s H is for Hawk (Jonathan Cape): the hype around this book made me cynical, but it’s true; she really has taken on the male bastion of nature writing, and moulded it into the female psyche. A goshawk called Mabel; superior descriptive writing, highly imaginative, compelling, raw emotion, thought-provoking, sad, funny: BRILLIANT! Laura McBride’s We are Called to Rise (Simon & Schuster), stirring debut based on a real incident due to the consequences of post-traumatic stress disorder, but fictionalised into an angry, uplifting look at American values, and how they relate to people who don’t quite fit in. Technically brilliant in handling the to-and fro between past and present and showing the impact of childhood on adulthood. I think it’s fair to say, this is the complete opposite of most American novels, and one I’d recommend if you’re into meaty, thought-provoking stories and strong female protagonists. **Linda Cracknell’s Call of the Undertow (Freight): atmospheric story about a cartographer’s move to the north of Scotland; the challenges she faces in a new environment is twisted in with the emotional baggage she packs with her, and the map work she’s undertaking as the story unfolds. The opening, with a mysterious snowman appearing in the garden, reminds of Eowyn Ivey’s The Snow Child – and it is and isn’t about motherhood and childlessness – but it’s a different book and sensibility. The title gives away the story, a bit, and a map or two would lift it for me, but I read the Kindle version so maybe the paperback has insets I didn’t see. Anyway, a good, satisfying, two-hour read. Sarah Maine’s debut, Bhalla Strand (Freight): another woman with emotional baggage moving north – this time it’s to take up her inheritance; a derelict house on an island, with secrets. I expected this book, from the woman with her back to us on the cover and the swirly title, to be a predictable romantic froth. It’s not! It’s technically assured, well written (apart from a couple of over-descriptive passages, which you forgive as it sweeps you along with the strong characterisation). The story moves smoothly between different time periods and different historical relationships, which kept it all moving forward, even when it was looking back. A really enjoyable story for a rainy afternoon. **Kamila Shamsie’s, A God in Every Stone (Bloomsbury): merges a story about colonial engagement in the First World War with a story about a female amateur archaeologist; the kind of book normally described as ‘ambitious’; ‘sweeping’. Let down by a fatal flaw at two-thirds in, which made me throw it on the floor. Before then, it’s a good, strong story about an aspect of war that is rarely covered by Western historians, twisted in with a story about early feminism and colonialism. I’m still not over it – but might be worth a re-read in a year or so. **Eimear McBride’s A Girl is a Half-formed Thing (Galley Beggar Press): fierce writing that haunts you when you’re reading it, and even now, thinking about it, I can see the young girl whose sad life we follow. Hard to get into its stuttering rhythm and narrative flow, but form and story combine to make a powerful story, and it’s well worth sticking to it until you’re hooked. Nancy Horan’s, Under the Wide and Starry Sky (Two Roads): I so wanted this book about Robert Louis Stevenson and Fanny Osborne to be good: who doesn’t want to know the real reason he tracked a divorcee and her children to San Francisco? Sadly, it hit the floor three times, and I had to give it away as I couldn’t bear it to be in the house. Good fictional biographies bring the real people alive, lets you see into the rationale for their actions, makes you want to re-read their books. Horan is so keen to build up Fanny Osborne that I wanted to call her up and ask why she’d portrayed Stevenson as a soppy wimp; apparently, according to this reading, it was Fanny who came up with the psychological underpinning of Jekyll and Hyde?! Andrea Gillies’s, The Enlightenment of Nina Findlay (Short Books): woman with emotional baggage has an accident on holiday; bedridden, she recounts her past life and relationships to her doctor. Any other writer would make this into a beach read – after all it’s set in a holiday resort in Greece – but Gillies has a sharp ear for dialogue and an empathy for women and the decisions they have to make. Intelligent and astute writing. **Kate Tough’s, Head for the Edge, Keep Walking (Cargo): about real women with real problems and emotional issues that could be worthy and sentimental, but isn’t. It’s gutsy and laugh-out-loud funny in places, although, there’s a wee tip to sweetness in the middle: a Tunnock’s Tea Cake of a novel. Warm and angry at the same time; a strong debut novel. Cherry Smyth’s Hold Still (Holland Park Press): fascinating biographical fiction. Set in London and Paris in the 1860s, it’s about Joanna Hifferman, amateur artist and muse/model to both Whistler and Courbier. What lifts the book from other fictional biographies is in the unusual decision to construct a thesis around Courbier’s painting: L’Origine du monde – depicting female genitalia – yes, weird, I know, how to sell this to your friends? Strong female protagonist and fine historical detailing; sometimes it seems too modern in its sensibility. Dreadful cover image, especially, as it’s a book about the world of painting. Pippa Goldschmidt’s The Falling Sky (Freight): coming of age debut; female protagonist with friendship, life, work issues; good at depicting the infighting and back-biting in academia, and how women need to conform to society’s image. Cleverly threads astronomy and time into the storyline. Maybe I learned something about space, but perhaps that was another me, another time. Susan Sellers’ Given the Choice (Cillian Press): intelligent, thoughtful look at an unlikable character – an ambitious agent; a woman who doesn’t want children – and the consequences to her relationships and herself. Set in the self-deceptive world of London arts, the protagonist is the arch deceiver: she deceives herself and those she comes into contact with, while her husband, a gentle soul, deals with it in his own way. Highly post-modern in the multiple endings that leave it up to the reader to decide which ending she should have; throwing the creative construction of the self into the imagination. An Interview with Joel Peckham. 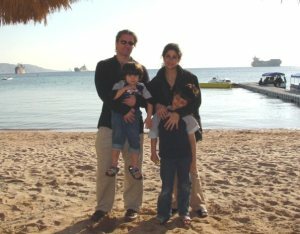 In 2004, Joel Peckham — father, husband, scholar, poet and writer — was in Jordan with his family on a Fulbright scholarship. They traveled to Aqaba in the south and were on the way back up north in the van of someone they didn’t know well. It was dark and late. The driver did not notice the sand truck in the middle of the road and the van crashed into it killing Joel’s young son, Cyrus, and his wife Susan. He and his youngest son, Darius, survived. Around five books in the last year have drawn me up short and made me think about narrative and storylines and the possibilities of literature and form. Last week I was running late for a train at Waverley without a book for the trip to Glasgow (around 40mins) and I nipped into the newsagent and, without thinking, other than to note it was only £7.99 for the paperback, I picked up The Flamethrowers. I haven’t read Kushner’s first novel or other writing and, although I’d heard the fuss about the book last year and knew critics on both sides of the Atlantic had raved about it, I hadn’t really paid too much attention to it. I wish I could wind back to last August when I passed on a ticket to go and listen to her talk at the Edinburgh book festival. I’ve wasted a whole year when I could have been thinking about this writing. It’s engaging and feisty; brimming with so many ideas that it hurts to read it. My copy is so well-thumbed I need a new copy. I carry it everywhere. I read out parts to Mr Bookrambler, who is not into literary fiction, but I needed to share the joy of intelligent writing with someone. I stop in the street and re-read paragraphs and sentences. I have to get up at night to re-read long passages. It’s exhilarating to find bold writing. It’s been called ‘muscular’ and the new American novel, which is somehow ‘novel’ as it’s written by a woman. Yet it is novel. It is an important book. There’s no getting away from the feminist aspects of the story. Reno – the protagonist is named by others from a place connection; we never hear her real name. There are long sections which she narrates but where she is passive and never speaks. A large part of the joy of the writing is in her deliberate passivisity (sp?). She chooses to be passive and to allow others to direct her actions, not because she’s weak but because she’s bold and self-willed. In summary (woefully inadequate) but the jist of it: the story opens in third person past tense. It’s 1917 and an Italian rider named Valera fights a German soldier. The narrative then switches to present tense, to the 1970s and the narration of an unnamed woman who is riding a Valera motorcycle to the salt flats to a time trial, or so she tells the young man called Stretch who offers her his bed for the night. It’s only partially true. She’s also going to film and photograph her tyre tracks as part of an art project she hopes to pull together. However, she chooses not to impart this information to the young man because it isn’t the story he should expect or have of her. The way in which Valera/Valera motorcycle intersect is integral to the way the story unfolds and it would spoil its unfolding to say too much. Throughout the novel, Time and History intersect and move apart, push off against each other and create new presents, new realities. Reno is constructed by the men around her (mostly men but women too) and by herself and the idea she has of how she thinks she ought to be. She has moved to New York to be where things happen. Something would happen, I was sure. A job, which I needed, but that could isolate a person even further. No. Some kind of event. “Tonight is the night,” I later believed I’d told myself on that particular night when I heard the music and Nina Simone’s voice, walked into the bar on Fourteenth Street, and met the people with the gun. But in truth I had not told myself anything. I had simply left my apartment to stroll, as I did every night. What occurred did so because I was open to it, and not because fate and I met at a certain angle. I had plenty of time to think about this later. I thought about it so much that the events of that evening sometimes ran along under my mood like a secret river, in the way that all buried truths rushed along quietly in some hidden place. Time too is constructed and how we perceive history is interrogated by the storyline. Italian history intersects with the 1970 anti-capitalist riots in New York and with art and creativity. But it’s also about a girl growing up and growing into herself. I really can’t implore you more to read The Flamethrowers. Both readers and writers will find their idea of what is possible with literature altered by the experience of reading it. Rachel Kushner’s website has links to interviews that give (or gave me) helpful insight into the book. See especially the frank and wide ranging interview on process and cultural memory with Dana Spiotta on Tin House.